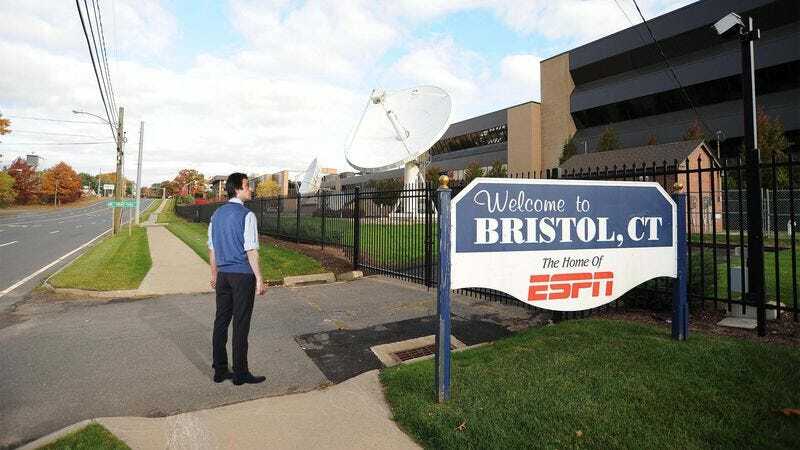 BRISTOL, CT—Curious to know the results of the previous day’s action across the world of sports, 42-year-old electrician Gary Bimel reportedly made the 939-mile journey from his home in Kenosha, WI to ESPN headquarters in Bristol, CT on Thursday in order to check the latest scores. Sources confirmed that after spending $534 on airfare to Hartford, renting a car, and gaining admission to the cable sports provider’s massive compound, Bimel found his way to the visitor’s center, where he made his request to look at all the scores and highlights. Bimmel, a father of four, said he traveled halfway across the country to find out the final score of the Giants-Rockies game, the results of the Georgia-Missouri college football matchup from Sept. 8, and whether the Brewers beat the Pirates. While waiting in the lobby of ESPN headquarters, Bimel frequently asked for reports on Thursday’s Baltimore Ravens practice, which players were on the Angels disabled list, and how many spots the Cowboys had moved down in this week’s NFL power rankings. Estimating the journey to ESPN headquarters took approximately seven hours, Bimel told reporters that visiting the cable network had saved him a telephone call to his brother to learn about the scores. “And the CNN/SI website doesn’t really have all the info I want,” Bimel added. Bimel confirmed that several of his buddies had asked him to find out how many touchdowns Aaron Rodgers has so far and his 11-year-old son, an Indians fan, had requested the score from the Minnesota-Cleveland game. In addition, Bimel promised his wife that he would search for when the WNBA season starts while he was at ESPN’s main office. Before leaving, the Wisconsin native said he inquired about taking some of the scores or stats home so he wouldn’t forget them. As of press time, Bimel had reportedly missed his flight home and was driving to NFL headquarters in New York City to see Joe Montana.